A few days ago the Internet went bananas over a language model so “dangerous” that Open.ai decided to keep it secret as if it was a nuclear bomb’s blueprint. We, at Alterra.ai, are working on making this type of technology available to every business, large and small. And to keep up with this promise, today we are launching Alterra Answer Bot for Zendesk. Powered by our neural NLP engine, it became the most accurate answer bot on the market, capable of deflecting four times more support tickets than old-fashioned bots. Alterra Answer Bot is a question-answering bot that can instantly resolve Tier 1 support tickets by finding answers in the company’s Knowledge Base. Why do support teams need the answer bot? Precise answers in almost real time are what today’s consumers expect when they interact with brands. According to the Salesforce Research on Customer Expectations, 64% of consumers and 80% of business buyers said they expect companies to respond to and interact with them in real time. As the millennial generation becomes more powerful in the marketplace, the issue will only become more pressing. Most companies can’t afford to hire enough support agents to provide immediate responses to every single customer question. Enter the answer bots. What makes Alterra Answer Bot the best on the market? With up to 90% precision, Alterra Answer Bot is the most accurate question answering bot on the market. The bot finds answers by meaning, not keywords. When customers ask a question, Alterra Answer Bot uses Deep Learning to understand the meaning of the question and instantly matches it to the right answer in the knowledge base. Alterra Answer Bot helps companies to drive customer satisfaction thanks to shorter time to resolution. We found that on average, Alterra Answer Bot instantly resolves 20% of support tickets, which is about four times more than old-fashioned bots. Moreover, the bot can work autonomously even when human workforce is offline, thus helping businesses to stay connected with customers 24/7. Support teams like working with Alterra Answer Bot because it takes care of the most common and simple questions. By reducing the repetitive tasks the Answer Bot allows humans to focus on more difficult cases and deliver personalized experiences to those customers who expect more human touch. 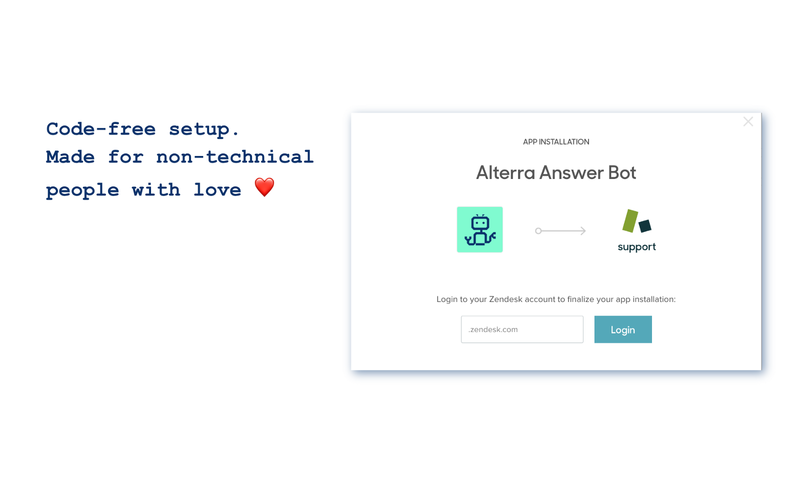 The integration with Zendesk means that from now on companies can use Alterra Answer Bot right there, within the Zendesk platform. We’ve made it easier than ever to train your own answer bot. You don’t have to be a Machine Learning expert to leverage the cutting-edge technology. The setup requires neither coding nor manually adding the answers. Alterra Answer Bot pulls the required information from the Zendesk Knowledge and converts it to an intelligent question answering bot. That’s it. The bot is ready to start working on day one. With time the system learns from its own mistakes and gets even smarter. The virtual customer assistant can resolve support tickets autonomously or work in tandem with human agents by suggesting answers in the Ticket Sidebar on agents’ desktop and thus helping them to resolve more tickets faster. Why not give a try? Install it today from Zendesk Marketplace or request a free demo here. Contact us at info@alterra.ai. We’ll be happy to answer your questions and help you to set up Alterra Answer Bot for your Zendesk team. Or go to our website and ask our Answer Bot questions about itself.